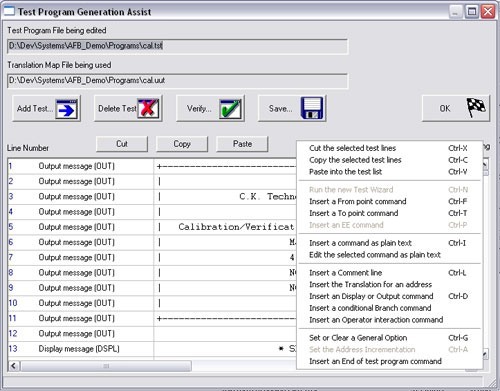 The Test Program Generation Assist was developed by CKT in order to provide Users with a low-cost, but powerful, tool for test program development. Define single contact, two wire contact and four wire connector contact listings. Quickly copy and reuse existing connector and contact definitions. Automatically counts the number of contacts in a connector. Provides the ability to view the translation map in test address order. The User is prompted in formulating the test command without needing to remember the test command syntax. Commands for User input and/or conditional branching are quickly defined. The test program can be developed in test system addess or assembly-under-test terminology. Test commands can be copied to or from the Windows clipboard. Each test command is displayed in a different color to aid legibility. Multiple test command lines can be specified in one screen. The test program can easily analyzed to identify addresses without defined tests.